One of the UK's fastest growing sectors, Health and Social Care offers excellent opportunities for employment, career progression and job satisfaction. 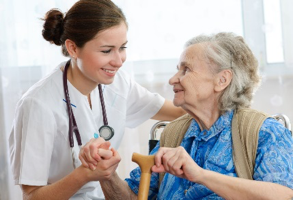 Learners must take the mandatory units which cover the role of the care worker, communication and confidentiality, equal opportunities, health safety and safeguarding. They then have a choice of optional knowledge and competence units covering different areas of health and social care such as supporting person-centred approaches, advocacy, healthcare, supporting those with disabilities, learning disabilities or dementia. Learners have the opportunity to take a general qualification in health and social care, or they may follow specialist pathways in Dementia Care or Learning Disabilities. The Level 2 Health and Social Care, is for those wishing to start their career in Health and Social Care and can be focused on dementia, old age or young and vulnerable people. It provides the necessary qualification to work in the Health and Social Care industry and can lead to progression. Level 3 is for those wishing to further develop their career in Health and Social Care and potentially move in to a more senior role, and can be focused on dementia, old age or young and vulnerable people. Level 5 is for those wishing to move in to management or already started in post as manager, and can be focused on dementia, old age or young and vulnerable people.